Notes: My British Australian Chinese knitterly fibery friend Cathy sent me this lovely gradient handspun yarn last year. I'd never worked with gradient yarn before, but I love the gradual long color changes and wanted to find a way to make the yarn show its best face. 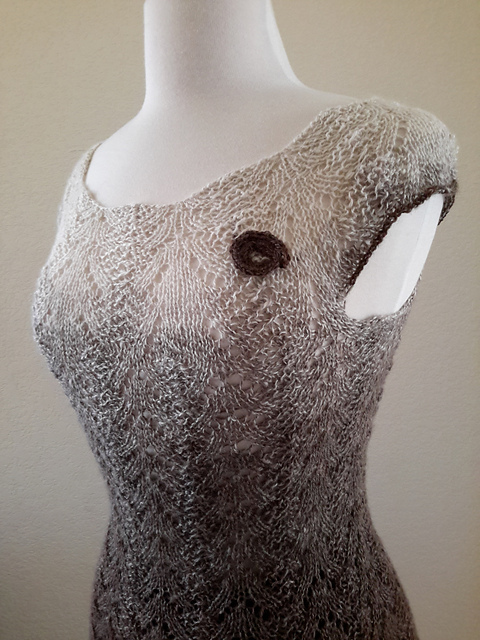 Since the yardage was fairly limited, I picked a top down pattern for a little top, so the light colors would be close to the face, and it gradually gets darker down the body. If I ran out of yarn and needed more length I could add some darker colors on the bottom. The top turned out to be the perfect length. I even had enough yarn to cast off the live stitches at the sleeves, and I used the last yard or so to make a little icord flower. That is perfectly gorgeous! Hope you have somewhere special planned to wear it! It's beautiful and I love that the yarn came from a friend. That gradient yarn sure does add to the already beautiful pattern. It is indeed lovely. Very fine work.